Product prices and availability are accurate as of 2019-02-28 13:29:31 EST and are subject to change. Any price and availability information displayed on http://www.amazon.com/ at the time of purchase will apply to the purchase of this product. The NIBCO 4701 coupling pipe fitting is made of chlorinated polyvinyl chloride (CPVC) and has slip connections. This coupling fitting connects two pipes going in the same direction with the same diameter to extend a straight run. It has female slip openings for sliding over the ends of male unthreaded pipes. The slip ends connect to pipes with a smooth bore for enhanced flow. 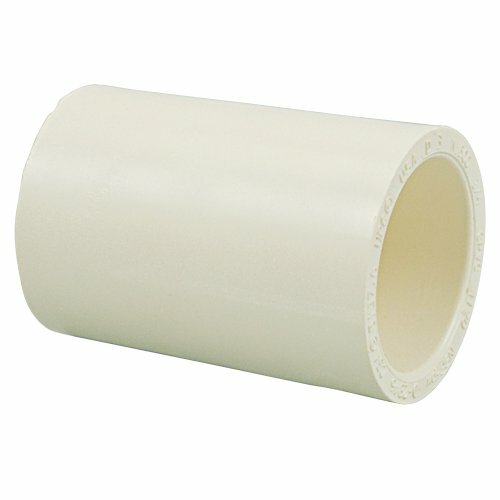 This fitting is made of high performance chlorinated polyvinyl chloride (CPVC) (FlowGuard Gold) for better ductility and resistance to higher pressures and temperatures than PVC, making it suitable for both hot and cold water pressure distribution systems in residential and commercial applications. CPVC can be connected to other materials such as steel or copper using transition fittings. This fitting provides superior flow to metal because of its smooth interior finish, which reduces friction and inhibits buildup of materials. This fitting meets American Society for Testing and Materials (ASTM) D2846 specifications for quality assurance.